Drum Corps International is in the running for a grant of $25,000 and the opportunity to vie for up to $500,000 as part of the latest edition of the Chase Community Giving campaign. We need your help! Voting is done through Facebook and takes less than 30 seconds. It's this easy: 1. 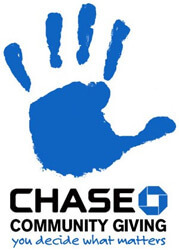 Go to Facebook.com/ChaseCommunityGiving and "like" the page. 2. Search "Drum Corps International." 3. Cast your vote and encourage your friends to do so as well! A select number of DCI corps are also in the running including the Blue Devils, Cadets, Glassmen and Santa Clara Vanguard, as well as DCI strategic partners Winter Guard International, Music for All, and MENC: The National Association for Music Education. Voting ends Wednesday, May 4! Learn more. The Academy The Academy announced the title of its 2011 production "( RE )," which will feature music by Bach, Whitacre and Adams. Blue Devils The Blue Devils revealed the concept of their 2011 production "The Beat My Heart Skipped," which is inspired by the works of Burt Bacharach. Explaining the program, the corps posted, "The maestro meets the motion in an emotional whirlwind of dazzling artistry rising from the blueprint of a seemingly ordinary array of yard lines. Bacharach along with the masterful performers of the Blue Devils are an invigorating combination of contemporary creativity with classic DNA." Blue Knights Blue Knights report that tickets sales are "brisk" for many of their sponsored 2011 DCI Tour events. Drum corps fans are encouraged to order early to have access to the best seats in the stadium. Boston Crusaders The Boston Crusaders' Best American Cadence Contest is in full swing. Your one to two minute cadence or "street beat" composition can win you prizes and the opportunity to have your composition performed this summer by the corps. You can check out some of the already-submitted competition on a Facebook page created specifically for the contest. The Cadets Youth Education in the Arts, parent organization of the Cadets, this week announced plans to form a second drum corps called Cadets2. The ensemble, which will be a "weekend-only" group, will compete as part of the all-age Drum Corps Associates circuit, however, will only be open to individuals between the ages of 16 and 22. Carolina Crown Carolina Crown is looking for a licensed/registered athletic trainer to work with the corps during its spring training and summer tour. A stipend is available to those interested in the position. The Cavaliers Cavaliers percussion alum Brian Archinal recently won first prize at the Gaudeamus Interpreters Competition, a contemporary music festival that took place in Amsterdam April 10-17. Colts Tickets for all four of the Colts-sponsored 2011 DCI Tour events are now on sale. Included are events in Waukee, Iowa, Olathe, Kan. and two in the corps' hometown of Dubuque. Colt Cadets Colt Cadets will perform a production titled "Notorious" in 2011. "We're excited to build on the momentum that the drum corps has gained over the past few seasons," said Jeff MacFarlane, program coordinator. "The growth of our students has allowed us to explore more mature concepts, as well as introduce them to some wonderful music in the process." Crossmen Jason Buckingham, brass caption head of the Crossmen, shares some personal memories on the corps' website about Star of Indiana founder Bill Cook who recently passed away. Genesis Genesis recently launched its new Economic Recovery Raffle Fundraiser which features a grand prize of $2,000 is available. All proceeds will support the corps' student scholarship fund. Glassmen Glassmen alum JJ Reinhart is featured in the Toledo Blade newspaper for his work as a sous chef at the Morimoto Waikiki restaurant in Hawaii. Reinhart was a part of the original production of the stage show "Blast" before attending culinary school in Arizona. Madison Scouts The Madison Scouts are currently recruiting volunteers to help the corps during its spring training and summer tour. Assistance is particularly needed on the corps' merchandise and food crews. Pacific Crest Pacific Crest is reaching out to corporations with sponsorship opportunities at its 2011 summer tour events. The corps says, "Whether it's a business card 'ad,' a sponsored page in the program, or your banner on the back sideline, your participation at any level informs the community of your company's support of drum corps!" Phantom Regiment The Rockford (Ill.) Area Music Industry (RAMI) will be inducting the Phantom Regiment into its Hall of Fame during the 20th annual RAMI awards event coming up on Friday, April 29. Thunder Thunder is mourning the loss of Howard Amos Robbins, who was the founder and director of the Spokane Percussion Naut Patriots. He was 92 years old. Troopers The Troopers will be making an early trip to the Midwest this June, as the corps is set to perform as part of the opening of a brand new Civil War exhibit at the Conner Prairie Interactive History Park on June 11 in Fishers, Ind. The corps, whose uniforms are modeled after the 11th Ohio Cavalry, was invited to make the performance by the Indiana Convention and Visitors Association.